This feature is a great new revenue stream for Instagram, as they will certainly get a cut of any sales made in the app. It also is a great complement to a lot of the most popular content on the platform. Instagram is dominated by public figures and “Instagram celebrities” who use the app to build their brand. For all these people who are promoting products and doing ads on their page, it means their followers are even more likely to buy. The payments will be processed through a partnership with Paypal and the user’s payment information will be stored within Instagram, which could be a point of tension, since Instagram is owned by Facebook. This development will likely lead to an increase in targeted ads on the app as well as an increase in companies using this new sales portal. Do you think this change will improve the user’s experience by allowing them to check out even easier? Or do you think they will become overwhelmed with the influx of ads on the app? I do not think the user experience will be entirely improved or impaired for Instagram users because there are multiple types of users for the app. The experience will improve for those looking to buy or sell products on the app, but will most likely worsen for those who just want to view and post content with minimal ad interruption. Personally, as someone who deleted my account over a year ago because I did not like the updates, I would be unhappy with the move towards an online marketplace as an Instagram user. This seems like a move to please Instagram’s most valuable accounts, while also taking a percentage of the transactions. I think it’s too much to throw at Instagram’s majority of users. Similar to how SnapChat usage declined after the infamous update that changed too much, I think Instagram will, unfortunately, follow suit. 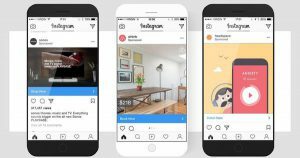 This is an interesting opportunity for Instagram and although it is reasonable to think that user experience could be weakened, in my opinion, users will gradually accept more ads and the fact that Instagram becoming a marketplace. We have seen several examples of this: when YouTube first made users watch ads before videos, people were dissatisfied and vocal about this on social media. However, most of us accept watching ads on Youtube now. Another example of ads acceptance is Facebook, owner of Instagram itself when Facebook started targeted ads on its platform.